As a media scholar, I savor those “ah-ha” moments that open my eyes to new possibilities of media communication. The best of those give me the sense I’m seeing something in a new way, and because of that, my understanding of what it means is changing. One of those moments came in grad school when I saw the TVTV documentary about the 1972 Republican convention, “Four More Years.” It wasn’t just the observational style of covering the convention, but in particular the interaction of the TVTV crew with the delegates and network news media that for me represented one of those moments when style and content work together to create new ways of seeing and knowing. In the documentary, the “legitimate” news media is mostly dismissive of the TVTV crew: they didn’t look like the “real” news media, and what they produced didn’t look like “the news” either. Fast-forward to 2008 and the recent Democratic and Republican conventions. In 2004 the “blogosphere” existed to cover the conventions, but online video a la YouTube hadn’t yet wedded to it. This year has been the first presidential cycle where there has been a significant “blogger video” coverage of the conventions. TVTV’s “Four More Years” was created in a moment when there was hope that portable video in the hands of “guerrilla” TV activists had radical potential for impacting culture. To begin assessing whether blogger video has any such potential, I’d like to consider how style and content might be working together in this emergent news media, creating new ways of seeing (and knowing). I began reading Talking Points Memo (TPM) four or five years ago, and watching its transformation from a straight-up, first-person blog, written by journalist Joshua Micah Marshall, into a veritable online news empire has been quite impressive. While some political blogs have been incorporated into MSM outlets like Time.com or Slate, TPM has fashioned itself as an alternative news network, adding not just technical staff but writers/producers who both report and comment upon the news. TPM in its expansion into video reporting (TPMtv), has developed a distinctive visual style rather than aspiring to match the aesthetics of traditional (network and cable) TV news. I’d like to look at several videos that show different ways in which TPMtv has managed to maintain a critical, authorial tone typical of political blogs and true to its roots, while in fact employing multiple authors and video producers. In recent years there have been two tastes for visual consumption that seem to contradict one another. On the one hand, those who can afford them have gobbled up high definition sets and built home theaters to enhance the quality of watching sporting events and movies in the home. At the same time, consumers have also shown that they are perfectly willing to watch a sloppily pirated DVD if it means getting that movie sooner and “free-er” and are willing to suffer frustrating download times or stuttering streaming clips that weren’t of high quality to begin with. This “lo-fi” aesthetic is usually not a stylistic affectation, but rather results from technological limitations or lack of production skills. Because it has become such a typical part of watching video online, however, it has become available as a televisual style, in the sense John Caldwell describes it, as television that self-consciously employs style to distinguish itself from “normal” TV. In the case of TPMtv, this televisual style serves to maintain the status of the new media news organization as an alternative to the MSM, even in the face of its growing success and expansion, and to a certain extent, its adoption of network news strategies. 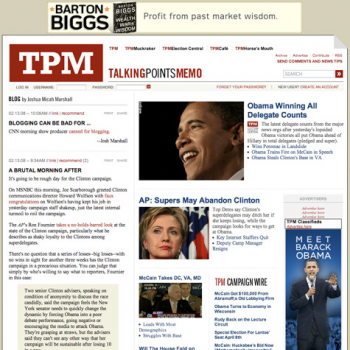 Type in “talkingpointsmemo.com” and you will still get the main page of the site, described in the masthead as “Blog by Joshua Micah Marshall.” But the top of the page lists what amount to different sections or “channels” of the site: TPM, which contains Marshall’s posted comments and links, but also some from his associates and featured comments by readers; TPM Muckraker, which is dedicated to investigative journalism; TPM Election Central, featuring polls, news, and commentary on the campaigns; TPMtv; and TPMCafe, the community discussion area of the site. Below are three clips from TPMtv posted during the party conventions and the week or two thereafter. In each case, I’d like to discuss how the visual aesthetics employ (or at least exhibit) the “lo-fi” aesthetic as well as other non-traditional TV aesthetics. Set aside Marshall’s unshaven face and thinning hair which make him look at least superficially different from most manicured TV news anchors. 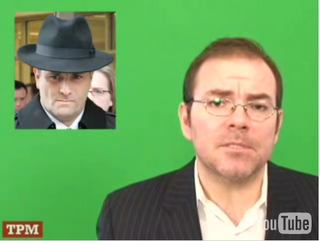 Often, TPMtv clips feature Marshall in front of a green screen and only momentarily feature graphics on it. More recently, they have begun covering the entire area behind him, as in this clip. The video editing skills needed to do this are pretty minimal. In this clip you see a couple of jump cuts in Marshall’s commentary–the sort of thing that is usually covered by a cutaway shot. These are common in nearly all of his clips. Also notable is the tone of his address: even his low volume suggests a person-to-person exchange rather than the typical broadcast, “mass communication” delivery. What Marshall introduces is essentially TPM produced video that contrasts McCain/Palin ads with footage from Palin’s earlier appearances as governor and/or mayor. The graphic framing of these within a TV, of course, also sets this up as a new media critique of political rhetoric on TV. Every week TPMtv does a “Sunday Show Round-Up” featuring clips from such political influential programs as Meet the Press and Face the Nation, which are routinely used by the campaigns to respond to news coverage and shape it for the future. Rather than simply serving as a highlight reel, TPMtv’s “Round-Up” clips are cleverly edited to critically comment upon the content with a satiric eye–without any actual narration by Marshall or other TPM staff. The influence of The Daily Show on this is hard to miss. In this clip, TPMtv reporter David Kurtz comments live as Michelle Obama ends her speech at the Democratic National Convention. Luckily, he shuts up and just lets you watch for most of it. The simplicity of the clip—its amateurish quality—doesn’t just contrast with network coverage or even the sans-pundit coverage available on CSPAN. For me, it gives the sense of being in the hall, particularly as you hear Barack Obama’s comments echo over the PA system and the audience noise in reaction to them (and especially to his daughter’s ad libs). The title of this last clip as it was originally posted on TPM was “TPMTV’s View Of Michelle Obama’s Speech.” I clicked on it expecting commentary on her speech, not literally “TPMtv’s view.” Instead I got one of those “ah-ha” moments: there’s a pleasure in watching this that isn’t about getting information or commentary, rather it’s TV putting us inside the convention via both technology and video style. In this clip and others, TPMtv offers a different way of knowing through television that works to maintain its alternative status (sometimes oppositional, usually complementary to MSM coverage). 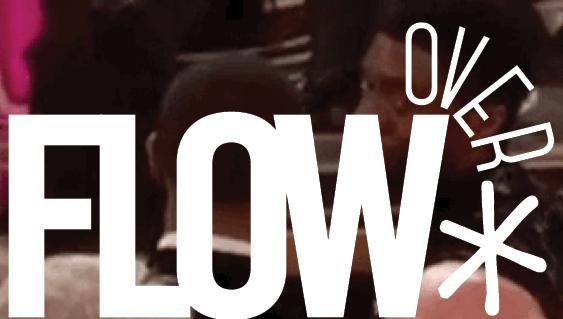 That televisual approach to creating a “blogger news network” seems derived from guerilla video a la TVTV’s coverage of the 1972 convention, The Daily Show’s satiric mash-ups, and the lo-fi aesthetics of viral video. Thanks for a great column, Ethan. I think the notion of aesthetics is an interesting and important one, particularly in these moments when new media outlets explicitly position themselves as alternatives to television. I like that you’ve pointed out that part of the lo-fi aesthetic of these videos (both in the content itself and because of the mechanisms through which we view them) results not only from an intentional or purposeful utilization of cheaper equipment, but also the limitations inherent in available technologies of production and exhibition. That this aesthetic, even if it’s not an affectation, can achieve political significance highlights the importance of the look and style of the videos. Since work on new media seems to focus somewhat less on style and aesthetics than, say, film studies, I think it’s great that you’ve brought this up.